One of the best non-techy Gundam wallpapers I've seen. Question, though; is "Titans" in reference to the Mobile Suits or their respective pilots? WaW what a superb wallpaper! it's really amazing! I love it! thanks for sharing it and keep up the great job! omg... so pretty!! !~ > 0 < gotta add to fav! it's so cool too.. it's destiny and... freedom? doesn't look like strike freedom.. but oh well.. XD thnx for sharing! this might be one of the best mecha wallpapers that i've seen in ages. great job nat! >.< It looks almost like an official poster. >_< Splendid~! 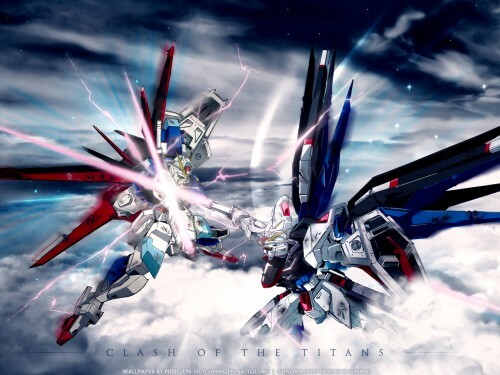 Wow, the most greatest mobile suits in Gundam SEED Destiny, this picture is awfull, but what's up with the cloud? Can't be better? thanks anyway. the bg is just brilliant. i dunno how you did it, but it looks just awesome. All Hail King Nat :D Nice job on combining the two pages togther and add all those effects to the picture. thats so cool and ... jzst very cool and very awesome work from you! i have wanted and i have desperatly waited of such a Gundam wall! my searches was not successful until today ... big thx for that! oh mad a gundam wall i really like how the two gundam's are battling it out a great job nat keep up the good work. It so beautifully make. Well everything is similiar to what happen in Epd 32. The background is veli similiar too. the fight between Freedom and Impulse is superb ba. The lighhting u make is very beautiful too. Well....I hope i can see more the wallpaper make by u! Freedom Rox! But certainly a great wall.